Ferbuary 23, 2009 | When Krista Allen began playing handball last spring, becoming a national champion at the sport was the last thing on her mind. 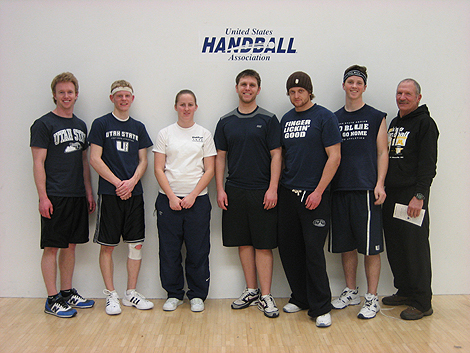 Allen, along with the five other members of the USU handball team, competed in the National Collegiate Handball Tournament in Minneapolis last weekend, and it was Allen who brought home the biggest prize of all -- a national championship in the women's C division. It was Allen's first trip to a national tournament. She had competed in two local tournaments prior to this week (one in Salt Lake City, the other in Pocatello, Idaho), but had never found her equal in female competitors. Winning both local tournaments with relative ease, Allen looked to the national tournament with a combined sense of opportunity and anxiety. It was here on a national stage that she hoped to meet her match. Allen blew through the competition at the national tournament, defeating opponents from Missouri State, the University of Florida, San Jose State, the University of Texas, SUNY-Stony Brook, University of Limerick (Ireland), and Texas A&M University. In all seven of her matches, Allen never gave up a game and was never forced into a tiebreaker. Her closest match was against Bailey Chandler of Missouri State. Allen won 21-6, 21-2. "It was our first time going [to the tournament] so we didn't really know what to expect," Allen said, "but I ended up doing really well." The rest of the team didn't cruise to championships, but still remained competitive and brought home trophies of silver and bronze from their divisions. 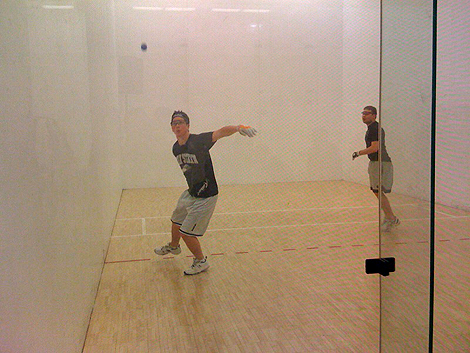 Zach Bateman competed in the men's C division and played in the championship match. After leading 11-7 in the first game, Bateman was eventually bested by Kevin Lammi of Lake Forest College, 21-14, 21-10. In the men's Challenger division (the division just below C), Aggies Brady Adams and Josh Sharp both made it to the semifinals before losing to Chad Bolin and Simon Hannover of SUNY-Stonybrook and Michigan State, respectively. After losing his first game 21-14, Sharp looked like he might make a comeback when he won the second game 21-17. Sharp dropped the tiebreaker 11-4. When the dust settled, five of the six Aggies had won a gold, silver, or bronze medal. Out of the 300 athletes representing 48 schools, the Aggies tallied 620 tournament points, which put them in 14th place overall. "The results we got out of it demonstrate that they did exceptionally well," said Ron Bachman, the team's assistant coach who accompanied the team to the tournament while head coach Herm Olsen stayed behind in Logan. "Herm and I are proud papas." The team will now take a short break before returning to routine practices. All but one of the team members will return to USU next year, and all have plans to compete again in next year's tournament. The woman who once thought handball was nothing more than a casual hobby now looks to defend her title at next year's tournament in College Station, Texas.